On VOCABULARY: The Verbal Aptitude questions will not include highfalutin words. Usually, the exam will only include commonly-used words in news articles, features, and editorials which most people find slightly confusing. On MATH : The exam will cover basic math lessons which you have probably already encountered when you were in high school (or perhaps even earlier). Usually, there will be questions involving Prime Numbers, Integers, Odd and Even Numbers, Absolute Value, Place Value, PEMDAS operations (Parenthesis, Exponents, Multiplication and/or Division, and then Addition and/or Subtraction), Decimals, Fractions, and Percentages (Interest Rate Problems and Sale/Discount/Profit Problems). There will also be Algebra questions in the form of Work Problems, Time and Distance Problems, and Age Problems. On GRAMMAR: The exam usually includes questions that will require you to fill in a blank in the sentence with the appropriate word from a given set of choices. There are also Sentence Error Identification Questions. To ace this section, know the various parts of speech. Review rules in subject (noun or pronoun) and verb agreement. The golden rule is that if the subject is singular, then the verb should also be singular. If the subject is plural, then the verb should also plural. That being said, you should learn how to find the subject in a sentence and how to determine if it is singular or plural. Know how indefinite pronouns, collective nouns, modifiers, conjunctions, and compound subjects work with verbs. In addition, make sure you know the different tenses of verb and how they are formed – simple tenses, progressive tenses, perfect tenses, and perfect progressive tenses. On WORD ANALOGY: The exam will include Single- and Double-Word Analogy Questions. To ace this part of the Civil Service Exam, you have to learn how to form a strong bridge sentence (a sentence that links/ that shows the relationship between the two given words). On LOGIC (For the Professional Level Exam): There will be ‘Finding the Best Assumption’ and ‘Finding the Best Conclusion’ questions. For the Assumption Questions, learn how to do the Negation Test (Test if a statement is an assumption required for an argument by simply negating it). In the case of Conclusion Questions, learn how to draw and interpret a Venn Diagram. It will also help if you can explore syllogistic fallacies which are usually taught as part of your Philosophy subject in college or in high school. On READING COMPREHENSION: Learn how to find the Main Idea of the sentence and how to separate it from the supporting details. Also, you have to know how to find the meaning of words based on Context Clues (how they were used in the paragraph). On PARAGRAPH ORGANIZATION: Be familiar with the different types of paragraph structures (Process, Cause and Effect, Argument, etc.). Read about Sequence Adverbs (first, then, next, finally, etc. ), Transition Words, and Conjunctions (and, if, but, etc.) too. Also, learn how to use the answer options as your guide in forming a coherent paragraph. On NUMBER SERIES: Be familiar with the common number series patterns (Prime or Odd Numbers, Squares or Cubes, Square Roots or Cube Roots, Pattern in differences, Pattern in adjacent/consecutive numbers, Complex Patterns). You can always start by finding the differences between two consecutive numbers in the series and then repeat the same process until you see a pattern you are familiar with. On GENERAL INFO: Read the Philippine Constitution and the Republic Act No. 6713. There will also be a few questions on Environmental Conservation, Territorial Disputes, and Indigenous People. PRACTICE READING to improve your verbal aptitude: If you are not a big fan of English literary fiction, make it a habit to read periodicals – and with that, I mean actual periodicals like news sites and magazines – not personal blogs and social media posts which usually have a lot of grammar mistakes. Read whenever you have the time to do so. Read when you’re stuck in heavy traffic along EDSA. Read when you’re on your way to school or to your office. If you come across a new word and you’re unsure of its meaning, check with a dictionary app like Merriam-Webster. Once you know its meaning, try to use it in a sentence or two. PRACTICE SOLVING MATH PROBLEMS to improve your numerical aptitude: Get a high school level math textbook and practice solving word problems. Remember that YOU CANNOT USE A CALCULATOR come the examination day so you really have to practice manual computations. The more you get acquainted with Math Word Problems, the easier it would be for you to discern what number sentences should be formed and what math formulas may be needed. Be careful in placing your decimal points and zeroes when finding the solution though. Life only has one rule: Never quit. In the middle of ever difficultly lies opportunity. Do something that your future self will thank you for. Panu po mkpg register pr mkpg take ng civil service exam? Thanks po..
Go to the nearest CSC branch and bring the requirements po. Until Jan 31 lang ang filing. All information can be seen in this site. Check niyo na lang. sir/madam hanggang kailan pwedeng mag file ng application sa caloocan city??? Jan 31 po ang last filing for March 18 Civil Service Exam. Saan po mag pa-file pag sa caloocan? Welcome! Stay tune lang sa site namin. We will be posting more sample questionnaires! 2yrs college grad po, PDE dn po ba mgtake PR mg-ecam civil service?? San po pdeng mgfile kung skli??? 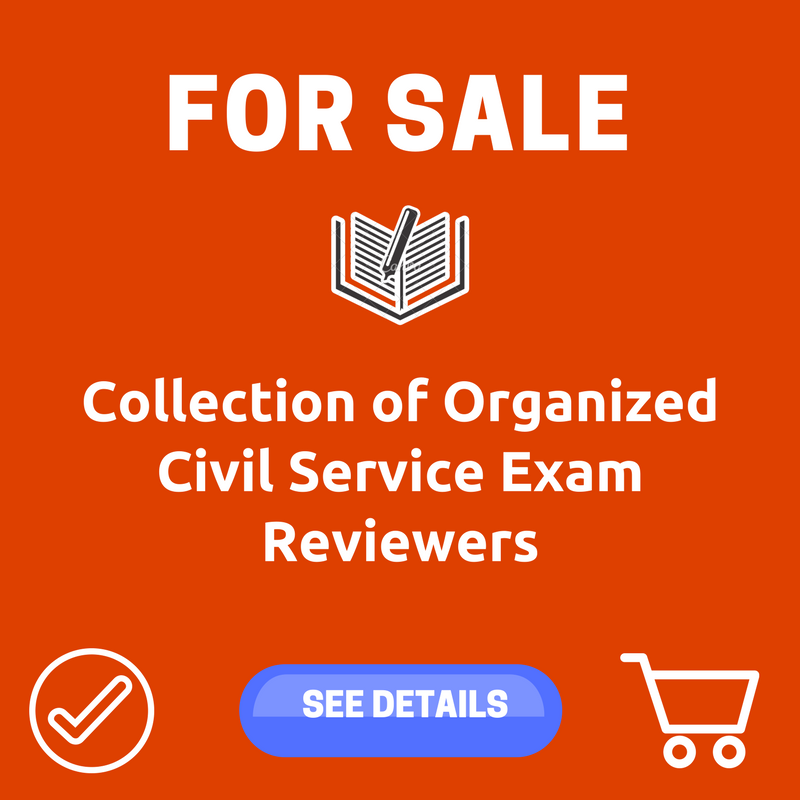 Ask q lng po kung anu po mga requirements pra mkpg fike ng civil service exam.bz lng po.tanx! Nasa menu tab po lahat ang mga useful links. Ilang valid ID po ang kailangan? Iisa palang po kasi ang ID ko ngayon sa apelyido ng asawa ko po eh.. puro sa pagladalaga pa.. Yes! As long as 18 years old kahit high school grad or hindi pwede sa Pro. hello po. kahit 1st year college lng ang natapos po pwede mka take ng PRO or SUBPRO lng.? You can take either Pro or SubPro. Basta 18 years old pataas. HS grad man or hindi. need po ba ng TOR pag nag apply for FOE kahit undergrad? Fire officer exam sana kukunin ko sir. How to apply po? Cs form 100 revised 2016 din ba form ko? Pareu lang ba lahat ng gagawin sa cse? Hello po. Okay lang po ba magtake ng exam kahit na nagaaral pa pero 18 years old na po? Yes pwede. You can take the Pro or SubPro kahit student ka pa. Basta 18 years old po. 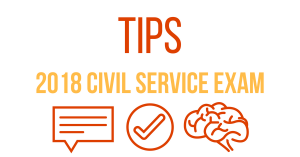 Pano po ba esolve ang scores sa pagkuha ng civil service? Hi! Did you take the CS Exam last October 2017? How did you find it? Anyway, thank you for this reviewer! It’ll help a lot! Hello. Tanong ko lang po, bat may mga nagtetake ng both subpro and pro CS exam? And, is it necessary, even in engineering field? Once you are a passer of Pro, no need to take the Sub Pro. Pero yung iba Sub Pro muna ang tina-try then saka nakuha ng Pro. Hi po saan po ba ang examination? Hi ! okey lang po ba mag take ng BCLTE kahit nag aaral pa sa college ?